Ourselves, our Neighbors and our Earth. These groups consist of discussion, followed by the insertion of acupuncture needles into specific points and then a guided meditation. 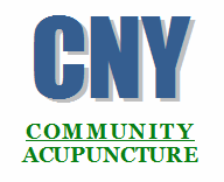 Acupuncture allows us to enter a deeper meditative state more quickly. We use points to open the flow of energy and center and ground us. Meditation in a group setting can increase our focus and amplify our awareness of connection.